Ghost in the Shell? No, Ghost in the Shoes. Reebok and Japanese figure maker MegaHouse are teaming up for a limited edition set of Ghost in the Shell: Stand Alone Complex sneaker. There will be only five hundred pairs in the world. In the world. 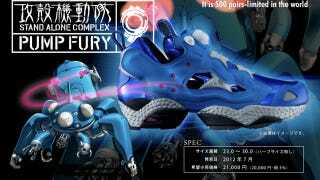 For the collaboration, Reebok's Insta Pump Fury was redesigned to look like Ghost in the Shell's Tachikoma—those fictional walker bots. The shoes go on sale next month in Japan and are priced at ¥21,000 (US$263).